Small ship cruises often come with a large price tag, but Variety Cruises has tapped into the hard-to-reach niche of offering intimate sailings at budget rates. Apart from establishing some serious “sea credit” for its popular Mediterranean voyages, the family-owned cruise line has just announced that it will be expanding into the Arabian Gulf beginning this November. The 7-night cruises will sail from Dubai or Muscat, and are available at some very attractive rates, starting from just $1,592 – a rare find for such a unique itinerary. Unlike many cruise ships that visit the region, the newly renovated Panorama holds just 49 passengers, providing a private, personalized setting. These enticing itineraries include 3-nights spent sailing and exploring the Musandam Peninsula, and two nights traveling around the Omani coast and interior. The ship will coast past scenic mountains, lagoons, and remote fjords, and numerous optional shore excursions are available for those wanting to venture farther inland. Cruisers can partake in water activities like diving and snorkeling, or they can hop on a 4-wheel-drive adventure to hot springs, fishing villages, and ancient fortresses. To learn more about these new itineraries, visit www.varietycruises.com. 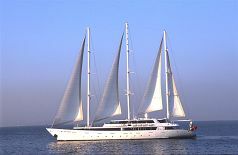 Or, check out this great offer on sailings to Greece from Variety Cruises with our Editor's Review.